Hi, in doing my research for pro anglers I know even these can roll. I was curios about adding scotty stabilizers/outriggers to help reduce that risk. I don't think I need them for stability per say but would they help reduce the risk of rolling the kayak? It looks like Hobie's options for stablizers are not compatible with pro anglers. Thank you. Not that hard to roll a PA even with skeg down, and oversized rudder. I’ve come close a few times, and know others who have taken the plunge. There should be plenty of diy examples to search, though well placed hobie sidekick amas should do the trick. What makes you think they aren’t sufficient? Too high above the waterline? From what I've read the bar is not long enough to be compatible with the Pro Anglers. I would think that aft of the rear tankwell is plenty narrow. Sidekick fit perfectly to my PA14. Extra stability is never superfluous. I would prefer the Hobie outriggers so thank you. How about the rolling aspect? Does anyone have experience with outriggers preventing rolling? From what I've seen most rolling occurs when a wave comes in from the side, are outriggers successful in preventing this? Those look to be the Hobie brand Outriggers (with an extension in the middle). Are you talking about adding the Adventure Island AKAS/AMAS?? The second could be and have been done as well- just a costly Mod. I believe they would need to be extended similarly to the Sidekick crossbars. Yes and no. We go back to initial versus secondary stability. The wider you make the boat the more it's going to roll with the surface swells and waves. Wether or not it'll capsize depends upon various issues. Just keep in mind that the non-capsizeable boat doesn't exist. If it floats, it can go upside down. Something guys need to be aware of is boat trim. Try to pack your heavier gear lower in the boat. In rougher waters keep the seat in the lowest possible position. Anything you can do to lower the center of gravity will help somewhat. That's the information I am looking for. 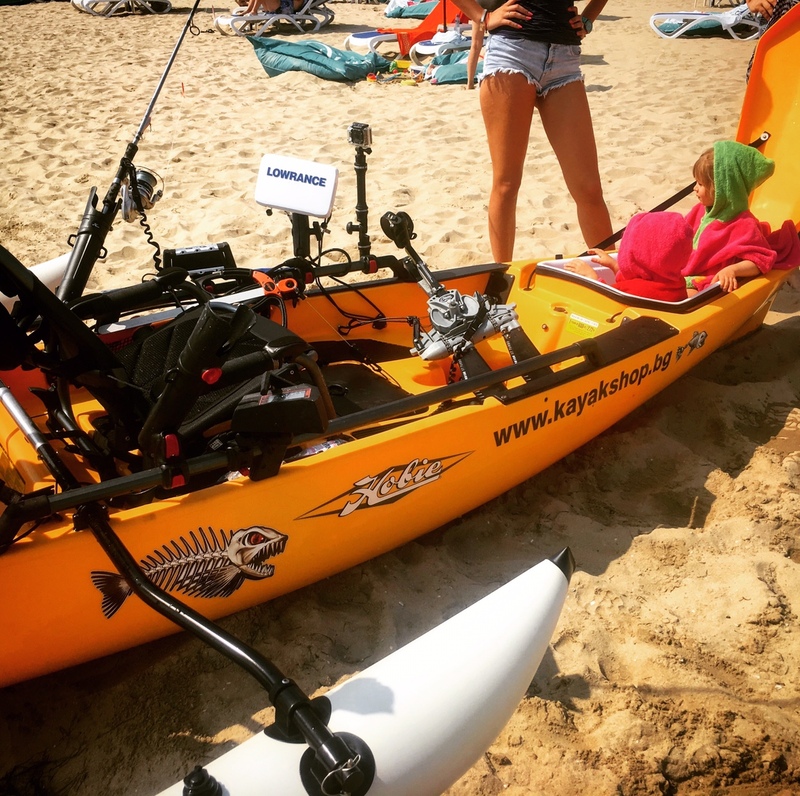 I have never had a fishing kayak before. I am aware anything can roll as you mentioned, I am trying to see what equipment (such as outriggers/stabilizers) can be bought to help reduce the risk. I rolled my PA14 a couple years ago about a mile offshore - Pacific ocean. Pretty good swell but I got careless. 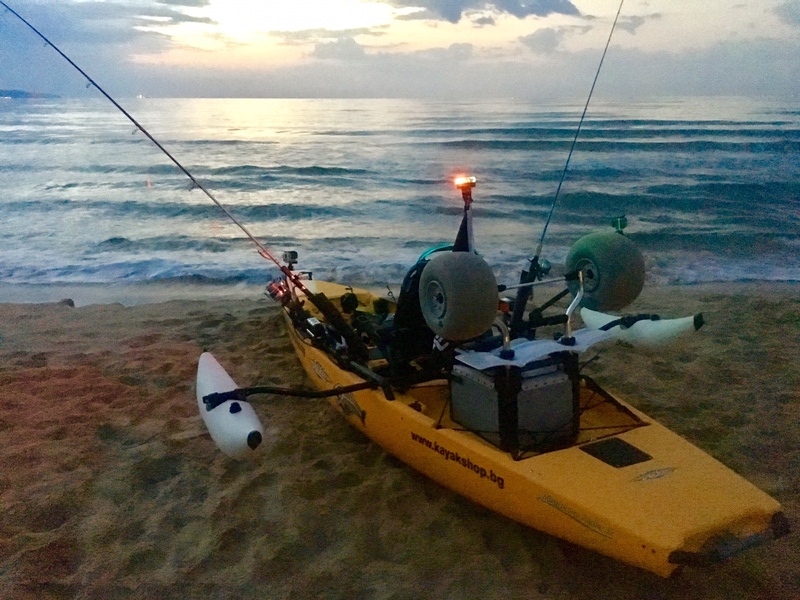 Two contributing factors; First, I had my seat in the high position (I'm 6'-2" and 245 lbs) and second, I had my Hobie H-Rail Tackle Bin positioned on the outside of the boat and filled with all sorts of heavy goodies - nearly 10 lbs worth! I have considered the Hobie Sidekicks, but have not gone that direction yet. I did however, install a stainless steel telescopic three rung deck ladder at the rear of the PA. When (notice I did not say "if") needed, the ladder is flipped over to hang down for easy reentry. I was unable to get back on the kayak myself and needed the assistance of my buddy who was nearby. Before installing the deck ladder, which by the way takes up very little room with narrow rungs, I tried self rescue in a pool using a rope with PVC rung ladder tied to the rear H-Rail. This turned out to be a fools exercise as it was almost impossible to pull myself up and back on. Your feet and legs need to be straight down or back behind you, to get back on board. When grabbing the H-Rail and placing one foot on the rope ladder, my foot went right up and to the bottom of the boat. Useless! My point is, you need a sound plan and method to turn your kayak back over and be able to get back on. I do like the idea of the Sidekicks, but make sure you can get back on first. Good luck! The ladder seems like a great solution for getting back on the yak after turtling. 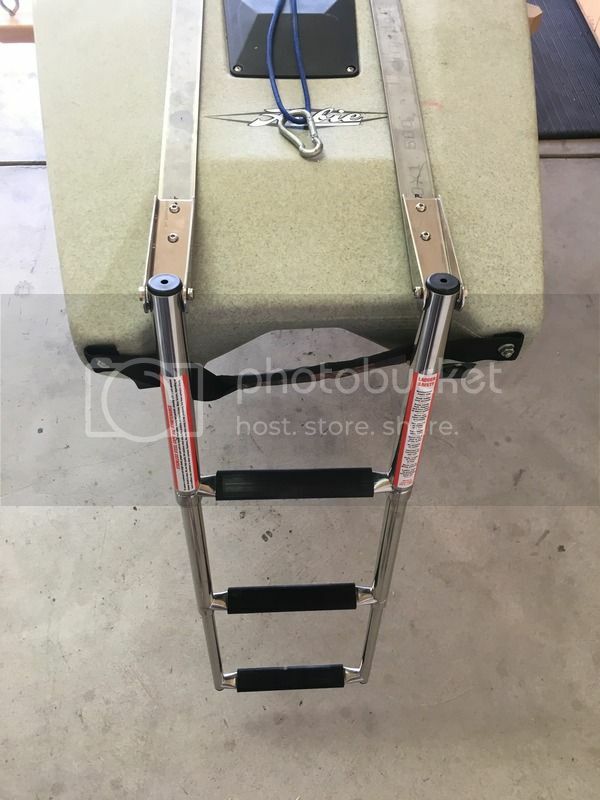 Where did you buy the ladder, got any pics? As Tom points out, if it floats, it can flip. So although sidekick stabilizers can potentiality reduce the likelihood of turtling, I suspect that they would also make it nearly impossible to right again. Anybody ever try righting in a controlled flip situation with stabilizers? I bought mine from West Marine, but here is one I found online at Amazon and much cheaper; https://www.amazon.com/M-ARINE-BABY-Sta ... dder&psc=1. 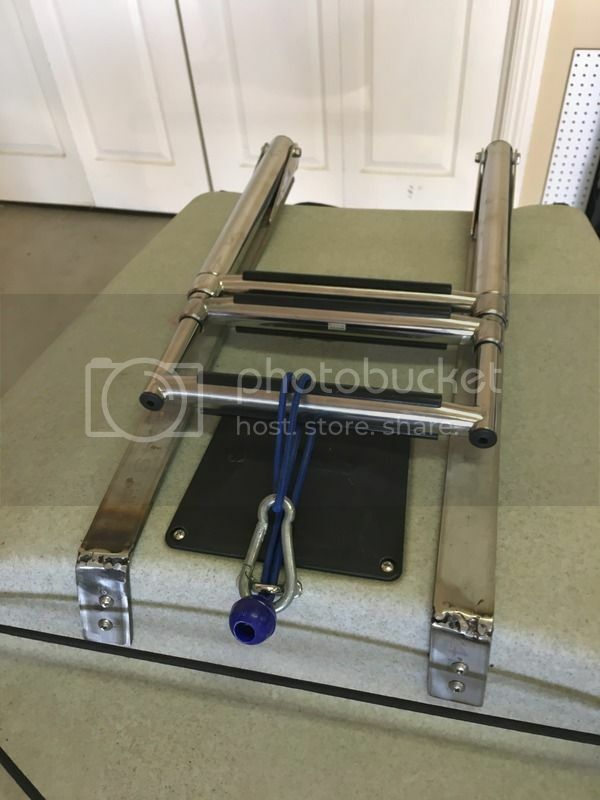 Used stainless steel flat bar and hardware to attach ladder to the flat bar and to the Hobie.